Mr. Kaput may truly be kaput now. It’ll take more than a few parking meters to cover the $200,000 bail for a West Side (Chicago) man charged with knocking over meters with his van in order to steal the contents. 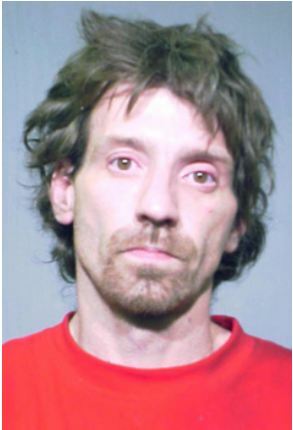 At a bond hearing today, prosecutors said Jeffrey Kaput literally knocked over four of the 200-pound boxes, valued at more than $6,000 each, earlier this month. “He would knock the boxes over with his van, at which point he would place them in the back of the van and remove the cash box,” Assistant State’s Attorney Lorraine Scaduto said in court. She did not say how much money Kaput allegedly recovered from the meters. October 31, 2010 Posted by oldstersview | crazy, Dumb Crook	| Comments Off on Mr. Kaput may truly be kaput now. Don’t eat more than two octopus heads a day. Authorities in the South Korean capital are trying to untangle themselves from a slimy row: how many octopus heads is it safe to eat? Octopus heads are a favorite dish on the peninsula — for their apparent aphrodisiac qualities. In September, the Seoul city government enraged restaurateurs and the fishing industry when it announced octopus heads contained hazardous amounts of cadmium, a carcinogen that poisons the liver and kidneys. 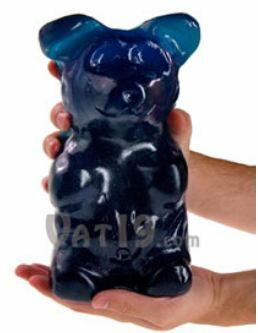 It advised against eating more than two heads a day. via Seoul squirms over octopus head war – Yahoo! News. October 26, 2010 Posted by oldstersview | animals	| Octopus, South Korea | Comments Off on Don’t eat more than two octopus heads a day. 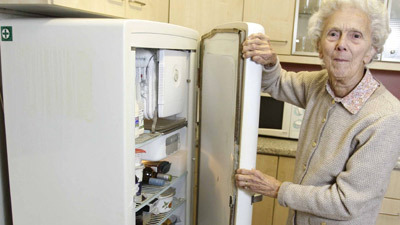 Britain’s oldest fridge is showing no signs of freezing up anytime soon – after 58 years of continuous use. Retired piano teacher Doris Stogdale bought the General Electric fridge when she and her family lived in what is now Malaysia in 1952. Mrs Stogdale, 89, of Oxford, recalls that it cost the equivalent of £135 – and has never needed any maintenance or even a single new part. via Britain’s oldest fridge still going strong | Orange UK. Terrified householders had to abandon an entire town after 3,000 illegally bred king cobra eggs hatched out and gave their owner the slip. The eggs – bred to supply the traditional health industry – had been stored in a cage in a house in Xianling, south west China. 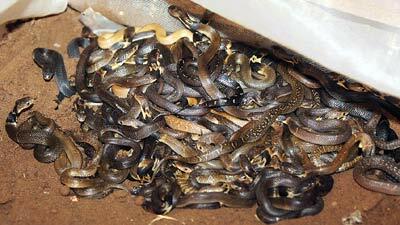 But the newly hatched snakes escaped through a hole in their enclosure and took over the entire town. The king Cobra is one of the most dangerous snakes in the world. 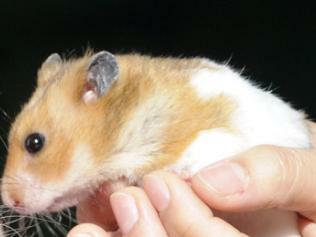 A Brisbane-bound plane from the UK was delayed in Brunei yesterday after a stowaway hamster was found on board. The high-flying rodent was seen running around the cabin by flight crew and caused the Royal Brunei flight to be evacuated while airline staff searched for it, the Courier-Mail reports. The plane was also fumigated. That celery you just bought? Wash it. Thoroughly. 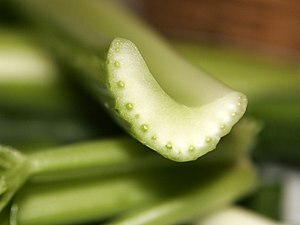 A food processing plant in Texas has been shut down after contaminated celery was linked to the deaths of four people. The victims all died from listeriosis food poisoning after eating chopped celery from the factory in San Antonio. The rare bacterial infection is particularly dangerous for newborn babies, pregnant women and the elderly. 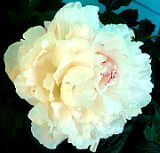 It can be caused by not washing or cooking raw vegetables properly. October 25, 2010 Posted by oldstersview | Scary	| Celery, Food processing, Listeriosis | Comments Off on That celery you just bought? Wash it. Thoroughly. A prison inmate who forged some court documents to gain custody of a boy and his trust fund probably should have at least spelled the judge’s name correctly. Kristine Flynn, 52, pleaded guilty Friday to three counts of trying to impersonate a Fond du Lac County circuit judge. With a habitual criminal enhancer, Flynn faces up to 22 1/2 years in prison at her sentencing next month. Line up, girls! The belly button lint collector is still single. (I wonder why? 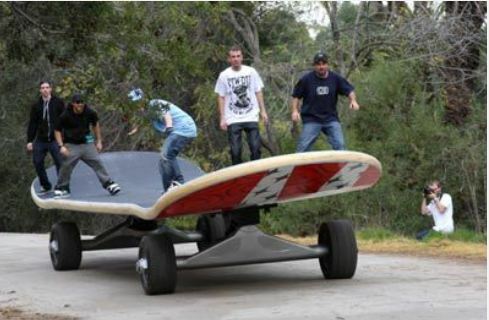 As hobbies go, it’s not something you are likely to share with too many friends on the grounds of good taste. 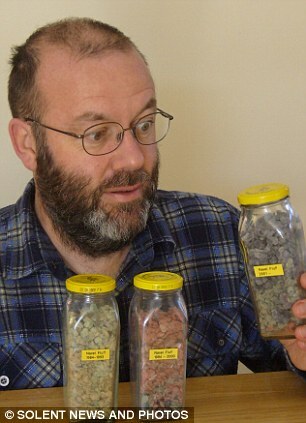 He has saved 22.1 grams of lint – after ‘harvesting’ it every day for 26 years and has even considered stuffing a cushion with his bizarre collection. via Librarian enters Guinness World Records for collecting the most ‘belly button fluff’ | Mail Online. Kyle Roberts has no interest in sitting in a jurors’ box and watching a trial unfold. 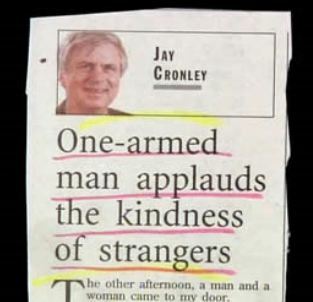 Don’t judge him too harshly though. He’s only 10, so performing his civic duty is not exactly a high priority. Assault with a dangerous sandwich? A Berwick, Maine, man turned himself into police Friday afternoon on a simple assault warrant alleging that he threw a sandwich at a deli clerk last weekend. October 23, 2010 Posted by oldstersview | Dumb Stuff	| Comments Off on Assault with a dangerous sandwich? 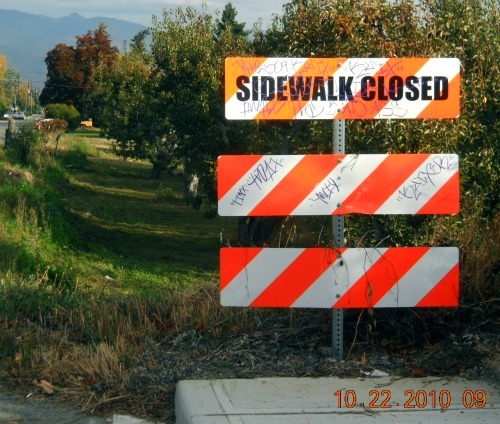 October 22, 2010 Posted by oldstersview | Odd signs, Photos	| Comments Off on Ummm…sidewalk? What sidewalk? A stowaway crocodile on a flight escaped from its carrier bag and sparked an onboard stampede that caused the flight to crash, killing 19 passengers and crew. 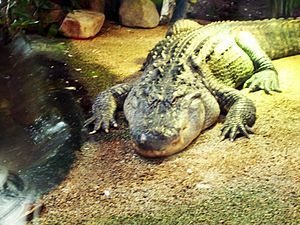 The croc had been hidden in a passenger’s sports bag – allegedly with plans to sell it – but it tore loose and ran amok, sparking panic. A stampede of terrified passengers caused the small aircraft to lose balance and tip over in mid-air during an internal flight in the Democratic Republic of Congo. HMS Astute? Maybe not so well named. A new British nuclear-powered submarine was towed free after running aground off the coast of northwest Scotland on Friday. 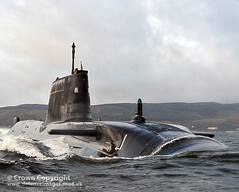 HMS Astute, the first of a new class of nuclear-powered submarines that was undergoing sea trials, became snagged on rocks off the Isle of Skye in an embarrassing incident for the Royal Navy. The Navy had to wait for hours for high tide before tugs could tow the advanced submarine to deeper water. via World news – Europe – msnbc.com. October 22, 2010 Posted by oldstersview | accident messes	| HMS Astute, Nuclear submarine, Royal Navy | Comments Off on HMS Astute? Maybe not so well named. 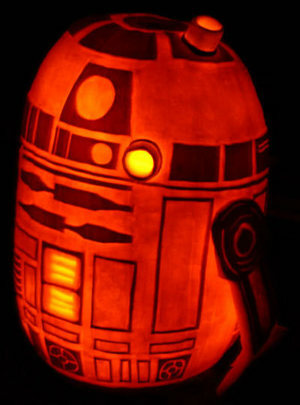 via Geeking Out For Halloween NPR. Measuring 48.5 inches from the tip of your nose to the tip of your tail bone is nothing if you are a snake. It’s not even much of a stretch for a sausage dog. But Stewie is a cat.